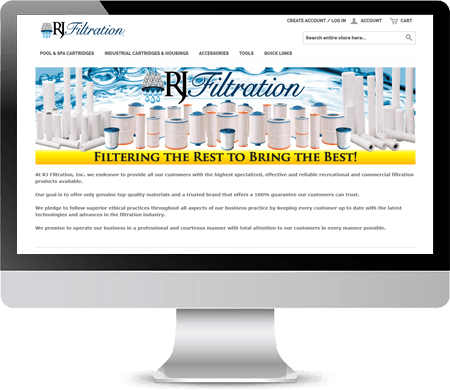 RJ Filtration has sold high-quality cartridges for more than 20 years and is recognized as an industry leader of pool, spa and industrial filtration products. 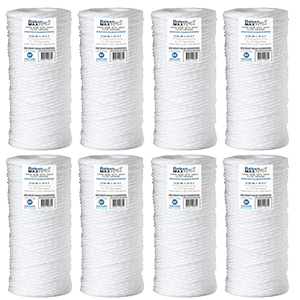 They sell a large variety of pool and spa filters including their own brand Baleen from their Filters4Less Amazon store. 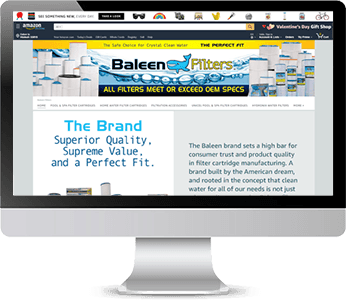 Baleen is the fastest growing brand of filters in the industry, but on Amazon, sales had plummeted year-over-year as their competition had gained full control over their product’s content. Besides losing content control over many of their ASINs, their top twenty selling products were no longer showing on Amazon. Needing to regain control of their products and increase sales for their client OperationROI created a strategy to rebuild their brand on Amazon. Sales had plummeted, the competition had full control of their brand messaging, and their top 20 best selling products weren’t showing up on Amazon…it couldn’t get much worse. To regain control of their product content and increase their sales on Amazon we had to address the underlying issues had have caused their decline. Fixing the product listing problems required a phased strategic plan so we could implement the necessary changes as well as work on focusing on their Baleen brand. Over the first 90 days, we established 3 goals: regain control of the products, optimize products listings, and get those missing top-selling products listed again. To accomplish the initial goals we had to get the Baleen brand registered with Amazon Brand Registry. Knowing this can take up to a month to get approved in parallel with began formulating an SEO friendly template that we could use for all of their products, as there was no consistency across there brand titles, details, or descriptions. Fortunately for Filters4Less the Brand Registry process with Amazon took less than a month. Once they had control of their own brand, we started the tedious process of merging ASINs as well as reclaiming control of brand messaging across all of their products. This included getting those top-selling products listed again. Sure it’s cliche to say we need to “win the Buy Box” but it was essential for Filters4Less. They were losing more Buy Box’s than they were winning. To compete on Amazon they had to get more competitive on pricing, as well as improve seller feedback and product reviews. 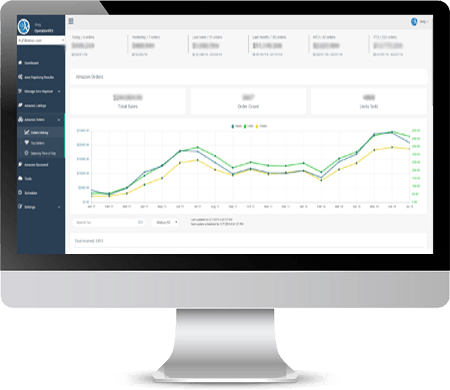 Leveraging our in-house OpSeller Enhanced E-commerce software we began repricing products to compete with other resellers. We established minimum prices and well as repricing rules to target specific products. After evaluating the competition, we introduced additional rules to only target specific sellers that we felt were worth competing against. During the same time frame, we developed a plan to increase the number of product reviews and seller feedback by launching a series of automated emails soliciting reviews. We were not only asking for feedback, but the series of emails was set up to build relationships with these new customers. After initiating the repricing we saw an increase in the number of Buy Boxes being won. And within a couple weeks, we began seeing the first product and seller reviews coming from our feedback efforts. Filter4Less was still not selling enough filters and their competition had the upper hand as they had been selling the Ballen brand filters for years. However, being the manufacturer does have its advantages. At OperationROI we understand that to a certain degree e-commerce is a numbers game…the more products you have listed, the more opportunities you have of being found. And if you can offer bundles or pack sizes that your competition cannot fulfill as easily and you now have a competitive advantage. All of their competitors were selling the same single unit products, but Filters4Less can easily offer groups of 2, 4 and 8-packs. And that’s just what we did. We began creating new listing options for spa and smaller pool filters with options of single, 2-pack, 4-pack and 8-pack options. A lot had been accomplished, but now it was time to take advantage of the additional benefits of being a registered brand on Amazon. First, a new Amazon Brand Store was created for the Baleen brand. Besides a home page with branding and marketing messaging, additional category pages were set up to better segment their product offerings for pools, spas, brands, and home filters. With the creation of the brand store, we were also able to direct some of the paid search efforts directly to this store, giving consumers more options from Baleen. We then discussed creating Enhanced Brand Content (EBC) for their products. Unfortunately with hundreds of products on Amazon, trying to create EBC content for all of these products was not reasonable. We decided to take a more strategic approach by selecting some of the more popular sizes and top-selling products as the starting point for creating this additional content. Unfortunately the timing of our engagement, and resolving many of the problems, it was decided to leave the paid campaigns running but lowering the bids for the remainder of the summer season. At the beginning of the next season, we were prepared. Using OpSeller we instituted new campaigns much more targeted than in past years as we spent much of the off-season finding the related products to specifically target. We utilized Sponsored Product Ads, Sponsored Brand Ads ( formerly Headline Search Ads), along with Amazon Coupons to help increase sales and reach more customers. And oh did it work well, those efforts saw an increase of 42.5% in sales when compared to the prior season. After the first full season with OperationROI, there was a year-over-year sales increase of 19%. After the second full season, there was a 52% jump in year-over-year sales revenue. An 81% increase in sales revenue and a 51% increase in the number of units sold may not sound like huge increases. But when your dealing in the volume and sales number that Filters4Less is selling on Amazon, these increase are significant and RJ Filtration couldn’t be happier. And let’s not forget the 42.5% increase in sales from the paid search efforts. This upcoming season we are expecting even greater numbers. Bolstered by the results from 2018 we have fine-tuned the repricing for OpSeller. 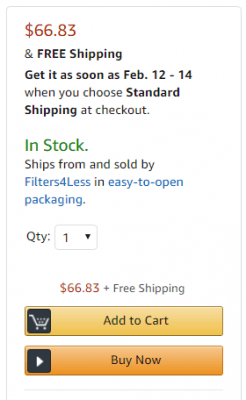 And with new advertising and targeting options from Amazon, the competition should be fearful of Filters4Less this year. We continue to grow the number of products being offered, as well as increasing the number of products with pack options. We think the revamped imagery and additional assortment options have improved the overall customer experience. The feedback strategy put in place almost two years again has garnered hundreds of reviews. Overall we couldn’t be happier with the growth of the Baleen brand and Filters4less on Amazon.